accompany the spotlight, and has mastered the diversity of presentations needed to sustain a twenty year career on the FLW Tour. To open the 2017 season, Rose tallied back-to-back victories on Lakes Guntersville and Travis, becoming the first angler in FLW history to win consecutive Tour-level events. 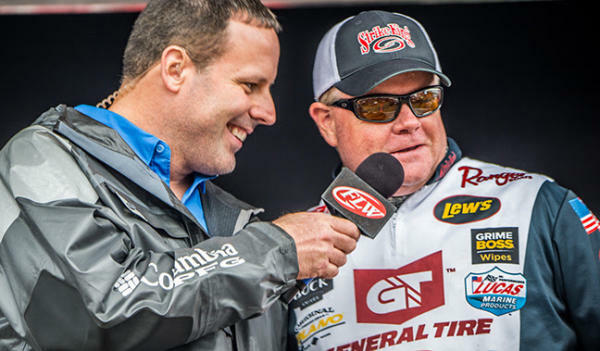 Then, capping a 2018 season that spanned the country from Lake Okeechobee to the Great Lakes, Rose wrapped his hands around a trophy that many have pursued but few have grasped. On a stage near Michigan’s Lake St. Clair, the Arkansas pro, joined by his wife and daughters, hoisted a trophy emblazoned with his new title: FLW Angler of the Year. Seaguar Tatsu is a Double-Structure 100% fluorocarbon line with exceptional knot strength and castability that exceeds the expectations of the world’s most demanding anglers. Double-Structure Fluorocarbons are prepared by a unique and innovative method, one that unites two different fluorocarbon resins into the finest fishing line available. In this proprietary co-extrusion process, a strong, sensitive fluorocarbon core is encased within a soft, supple, fluorocarbon exterior. The bond between the two resins is intimate and unbreakable, and results in a Double-Structure Fluorocarbon line that exhibits the beneficial attributes of each of its two components. Forget about having to choose between strong and supple, or between sensitive and castable. With Seaguar Double-Structure Fluorocarbons, you can have it all, in a single spool of 100% fluorocarbon fishing line. Seaguar salutes professional angler Mark Rose, who made every cast and caught every fish in his Angler of the Year season using Seaguar 100% fluorocarbon and premium braided lines. As Rose stated, “confidence breeds success;” Seaguar line will also fill you with the confidence you need to compete and win. Spool up with Seaguar, and you’ll soon learn why the most successful anglers in the world rely on lines and leaders that are Always The Best!